You will, I believe, find the analysis of Donald Tusk’s response to David Cameron’s rather lame begging letter of interest. It is my opinion that David Cameron’s list of requests was so weak and limited that even if every point was fulfilled and granted by the EU it would still prove inadequate to silence the Leave-The-EU lobby, and solve Cameron’s problems with dissident back benchers wishing to Leave-The-EU and the army of supportn for Leaving, in the long run. I do concede that if Cameron can cobble together something of a plausible fudge backed with FUD and a great deal of EU & Government funded propaganda he may well obtain a ‘Remain’ vote in his Referendum, but the sheer dishonesty will, I believe, fail to silence the Leave-The-EU lobby who will in the end win, though it may take quite some time. Membership of the EU has never sat easy on the shoulders of the peoples of Beritain, however much money a few Politicians and Civil Servants have made out of it! Britain’s membership of the EU has been hugely damaging to these United Kingdoms if on in the manner it has divided the people and occupied so very much productive time so very divisively. There is of course the very real prospect that the EU itself will collapse when Britain leaves or even collapse as a result of Britain remaining – but collapse it will as it is founded on dishonesty, corruption, greed and a lack of ethical principles in its clear Frnco Germanic dominated structure so damaging to other ethnic and National blocks. In response to David Cameron’s letter to Donald Tusk last month, we now have the formal response to what the European Council President calls “a significant and far-reaching agenda”. From Tusk himself, the purpose of the letter is to let Mr Cameron know where the Council stands “on the issue of a UK in/out referendum” before it is addressed at the December meeting. Notably, Mr Tusk makes no reference to “demands”, which is unsurprising: Mr Cameron does not in his letter refer to them. Despite by now thousands of articles referring these non-existent “demands”, what the Prime Minister actually did was write a letter “setting out the areas where I am seeking reforms”. What Mr Tusk does, therefore, is note that, in November, Prime Minister Cameron “set out the four areas where he is seeking reforms to address the concerns of the British people over UK membership of the European Union”. Unlike the media, he is thus demonstrating that he is able to read. 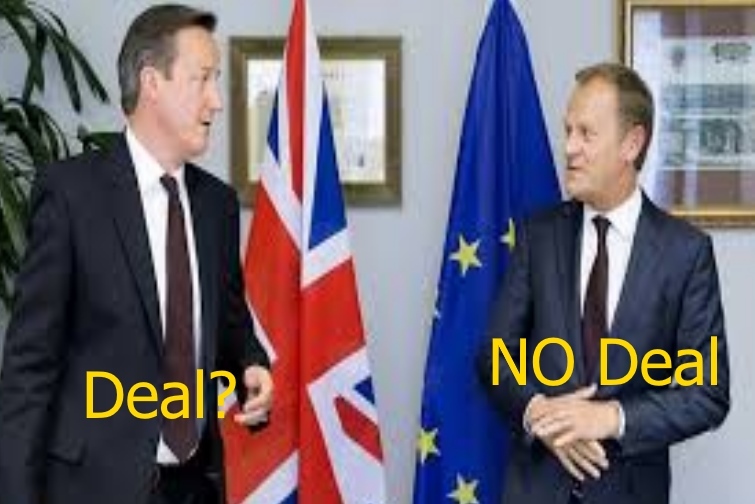 Following Cameron’s letter, in close cooperation with the Commission, Tusk and his officials “held extensive bilateral consultations at Sherpa level with all Member States”. They also discussed Mr Cameron’s letter with representatives of the European Parliament. In the view of Mr Tusk, the issues raised by the British Prime Minister are “difficult”. At the same time, he says, “there is a strong will on the part of all sides to find solutions that respond to the British request while benefiting the European Union as a whole”. He then looks at what he calls the “four baskets” mentioned by Mr Cameron, and “briefly” sets out his assessment of where the Council stands. On the “relations between the euro ins and outs”, he says, “we could search for an agreement around a set of principles that will ensure the possibility for the euro area to develop further and be efficient while avoiding any kind of discrimination vis-à-vis Member States that are not yet, or, in some cases, will not be part of the euro”. This is a key area of concern for the British government, mentioned not only by Mr Cameron but also by George Osborne. This is very much our “two-tier Europe” writ large. And Tusk says that the Council is “looking into the possibility of a mechanism” that will support the principles of non-discrimination. What he seems to have in mind may be a consultation process, “allowing Member States that are not in the euro the opportunity to raise concerns, and have them heard, if they feel that these principles are not being followed”. This, however, he says, must not be “a veto right”. Whether this will be sufficient for the UK government remains to be seen, as there are no details offered. We don’t get past the willingness to “search for an agreement” and the idea of an unspecified “mechanism”. This is pretty vague and non-specific stuff. The next “basket” had Mr Cameron talking about “competitiveness”. And – it seems – “everybody agrees on the need to further work on better regulation and on lessening the burdens on business while maintaining high standards”. Tusk adds: “The contribution of trade to growth is also very important in this respect, in particular trade agreements with fast growing parts of the world”. That said, again we are offered nothing substantive. In fact, we are offered nothing at all. There is agreement with Mr Cameron’s concerns, but stating that is as far as Mr Tusk is prepared to go. This brings us to the third basket on “sovereignty”. Mr Cameron, you will recall, wanted to end Britain’s obligation to work towards an “ever closer union” as set out in the Treaty. It was very important, he said, “to make clear that this commitment will no longer apply to the United Kingdom”. Furthermore, Mr Cameron wanted this done in “a formal, legally-binding and irreversible way”. Now, there can be little dispute that, for the Council to concede this, a treaty change is needed. After all, Mr Cameron wants the words of the treaty and their essential objectives changed. But all we actually get from Mr Tusk is a fairly anodyne statement that, “there is wide agreement that the concept of ‘ever closer union among the peoples’ allows for various paths of integration for different countries”. He adds: “Those that want to deepen integration can move ahead, while respecting the wish of those who do not want to deepen any further”. Whatever complexion you might wish to put on this, it is fairly evident that it does not concede the sort of detail that Mr Cameron was expecting to have discussed. Furthermore, while there limited scope for those that want to deepen integration to move ahead, the scope is limited. And it does not allow for the eurozone to move ahead – without the approval of the rest of the Community. On that basis, respecting the wish of those who do not want to deepen any further is rather moot. In most respects, the advance guard cannot advance. Additionally, Mr Cameron wanted “to enhance the role of national parliaments, by proposing a new arrangement where groups of national parliaments, acting together, can stop unwanted legislative proposals”. He was, though, prepared to discuss the precise threshold of national parliaments required. Couched in these terms, we are looking at something fairly weak, but it still mounts a challenge to the legislative monopoly of the EU institutions, giving national institutions what amounts to a veto. It also constitutes a major challenge to the European Parliament. This would also need a “full-on” treaty change, as would Mr Cameron’s third “proposal”, that the EU’s commitments to subsidiarity should be fully implemented, with clear proposals to achieve that. Yet Tusk’s response amounts to the vague statement that: “There is also a largely shared view on the importance of the role of national parliaments within the Union as well as strong emphasis on the principle of subsidiarity”. This does not even meet Mr Cameron half way. That brings us to the “fourth basket”, covering “social benefits and the free movement of persons”. With no indication that he is being ironic, Tusk describes this as “most delicate”, saying it “will require a substantive political debate at our December meeting”. Says Tusk: “While we see good prospects for agreeing on ways to fight abuses and possibly on some reforms related to the export of child benefits, there is presently no consensus on the request that people coming to Britain from the EU must live there and contribute for four years before they qualify for in-work benefits or social housing”. In the view of the Council President: “This is certainly an issue where we need to hear more from the British Prime Minister and an open debate among ourselves before proceeding further”. With that, it is Tusk’s assessment that “so far we have made good progress. We need some more time to sort out the precise drafting on all of these issues, including the exact legal form the final deal will take”. In his view, “We also have to overcome the substantial political differences that we still have on the issue of social benefits and free movement”. It is now expected that the December European Council should address all the political dilemmas related to this process. Based on a substantive political discussion, Tusk thinks we (the Council) should be able to prepare a concrete proposal to be finally adopted in February. This actually seems extraordinarily optimistic, given that the Council has yet to concede most of the key issues, or even recognise their importance, beyond conceding that they are “difficult”. Nevertheless, Tusk says he will act as “an honest broker” but all Member States and the institutions “must show readiness for compromise for this process to succeed”. Our goal, he says, “is to find solutions that will meet the expectations of the British Prime Minister, while cementing the foundations on which the EU is based”. In his concluding remarks, Tusk tells us that uncertainty about the future (is there uncertainty about the past?) of the UK in the European Union is a destabilising factor. That is why, he says, “we must find a way to answer the British concerns as quickly as possible”. We need to be united and strong, in “our common interest and in the interest of each and every EU Member State”, he says, then finishing with the statement: “The UK has played a constructive and important role in the development of the European Union and I am sure that it will continue to do so in the future”. Whether or not that final statement is merely extruded verbal material or something more profound is not really an issue. What matters is that, despite the insistence of the media and others that the UK is not asking for much, the removal of “ever closer union” and the parliamentary vetoes are a big deal for the EU. They amount to fundamental changes in the way the Union is structured, its primary objectives and the way it does business. Equally, as Mr Osborne made clear, separation of the eurozone and the non-euro states is also a big deal. This is not something that can be resolved with a few bland statements of intent. Like as not, we must anticipate a fundamental restructuring of the Union and the recognition of a two-tier Europe. On that basis, the chances of a final proposal being adopted in February seem to be so remote as to be at vanishing point. The media and others may wish to obsess about the details relating to in-work benefits and social housing, but these are small beer compared with the other issues. There is, therefore, much more to this than is being admitted. As always, we are being played. And, as always, the commentariat are walking into this eyes wide shut. We have the “leavers” squawking about Mr Cameron only asking for “trivial” changes and the delivery of a fudge, confusing fluff and substance and blasting away with their footguns. Farage is totally missing the point while the media remain obsessed with the limited issue of benefits for migrants, with not the least understanding of the bigger picture. Crucially, none seem to have spotted that the Tusk letter is internally inconsistent. It is understandable that Tusk is making a big deal of the benefits for migrants, thus playing to the gallery, but it isn’t clear why he is playing down the other issues when, potentially, they are even more problematical and he admits to them being “difficult”. Looking beyond the theatre, what he is writing doesn’t fit with the facts on the ground. And if there is nothing inconsistent with our expectations that Cameron will resolve the many problems with his “British model”, what does not compute is the lack of fuss being made about them. If the Prime Minister is to turn resolving the issues into his great “victory”, he and Tusk need to inject a little more drama, and much more conflict. Just a simple little victory over benefits for migrants is not going to turn the tide. My gut feeling, therefore, is that there is more of this drama yet to be rolled out. The December Council is obviously going to be a non-event, and everything will now be focused on the meeting in February. My best guess is that the benefits for migrants will be resolved after a highly staged denouement. But that will not be the end of it. It will only pave the way for the greater battles over “ever closer union”, the eurozone and the parliamentary veto, each of which will have their place in the sun. Thus, February will only be one small victory, with greater battles to come and more intense theatre, before we finally see the shape of the “British model” revealed to us all. We still have a long way to go before we get to the end game. Next Next post: ‘British Influence’ In Obduracy Or Dishonesty – One Wonders!